I read good reviews of ROCKY BOXER machines on the Internet and decided to buy one, it took very little time to order and to get it delivered, and although the machine is quite heavy I managed to install it by myself. In the first couple of days not many people wanted to try their strength with it, but on the third day and from then on then young people couldn’t be dragged away from the machine, everyone is very happy. A month later I ordered two more machines. I’m very happy with the products and the work of the company. Thank you very much! Pluses: Someone took really good care of safe packaging: it is quite impossible to damage the machines in any transportation conditions. Machines are very solidly built, the glass is very thick and held with rubber glue, the punch bag mechanism is very powerful. The doors are so firm that you can’t even get under them with a tire iron. 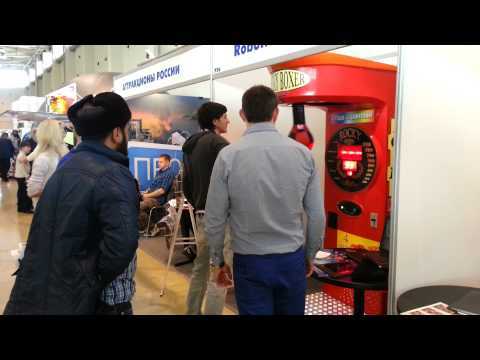 Whenever any small questions arose about the functioning or adjustment of the machine they always replied even after working hours, and you can always get a quick consultation standing right in front of the machine even at 10 p.m.
We decided to set up a network of RockyBoxer machines. It only took a month. The only problem is that wet and torn banknotes get jammed. The machines proved really good in the cold weather. They are only too happy to accept huge bags of coins at the chemist’s in exchange for banknotes. We thought it a good idea to stock up on spare parts, and ended up getting a very good discount even on spare parts. Pluses: Stable work. There are certain problems, of course, but far fewer than with prize machine or air hockey as there are no consumables and there is nothing to steal, while the profits are sometimes higher than in entertainment centers. It’s very easy to work with both, the machines and the company – always available, never out of stock, any problem is instantly solved, everything is done for the client’s convenience. Minuses: The bags of coins that the machines fill up with very heavy to carry. I’ve been working on installing all kinds of terminals for a long time now. A network of about three hundred machines brings me a good profit. And so I found your website. The website is very convenient and user friendly. The Boxers got me interested. I didn’t spend too much time thinking about it, the advantages are obvious, it can be kept outside, all year round, in any kind of weather and brings good money. The photos and reviews on different websites all say the quality is excellent. And the discounts are great! You did surprise me there! I decided to go the whole hog and ordered 70 of them at once. Pluses: I had the money, so I paid the whole sum right away. We agreed with the St Petersburg office that they would send me 30 machines per month not to let their regular customers down. It all went surprisingly well, all according to the plan. The machines are of excellent quality, they look great, the lease providers are delighted and there are more clients now. We were worried that there might be fights because of them but it turned out exactly the other way around, we monitored the number of conflict situations in establishments – they disappeared altogether! Minuses: Easy and flexible adjustment and installment make it possible to spread the network in the city very quickly. We can’t install them at such a pace at the moment, so we asked the company to hold back the remaining deliveries and they kindly agreed to keep them at their warehouse for the time being. It’s a pleasure to work with their team. They are the most reliable and responsible partners you could wish for. And the profits are several times higher than with jukeboxes, although it’s not even the season at the moment. I’ve been in the arcade machines business for five years now. I’ve bought products from different companies and shops. I came across your website recently – reasonable prices, everything is very well organized. I decided to place a trial order, you delivered on all my expectations, no excuses about delivery delays or being out of stock, on the whole I’m satisfied, and I’ll definitely contact you again. Six weeks ago I received the boxing machine I’d ordered, plugged it in and that was it. I bought it for my business (a summer cafe), I wanted to add a touch of interest to the place, and the money is surprisingly good. I got a return on the machine in less than two months! Now we have our little tournaments in the evening and I’m very happy. Everything is great. I’m happy with the purchase. The system works like clockwork – order-payment-delivery – everything is fast and convenient. Well done! I’ve been working with you for a few years now and I like the way you do things. You give really valuable advice, I’m glad I’d found a company with prices on arcade machines and terms of delivery that I’m fully satisfied with. I wish you success and prosperity. I ordered a boxing machine, I wanted a bit of variety in my own business, because they were all slides, electric cars and trampolines before. Your products are really high quality – not a single serious problem in six months, the boxing machine works like a charm and it’s in great demand, especially among young people. Thank you! I bought a boxing machine two years ago. The price was the lowest on the market, so I hoped it would last me at least one season at the seaside. It’s been two years now and it’s as good as new despite all the things people do to it! I got eight times my return already. Anyway, the iron Rocky is the best. I’m pleased with your prices and how you treat your clients – very polite, no nonsense, and, of course, the service you provide – fast, no delays. By the way, thank you for providing the measurements of the freight, they really helped me calculate the cost of transportation. I wish you success, and thank you for the fruitful cooperation! Before I found your company I used to order boxing machines in different places, there aren’t any huge differences, but! You are real professionals in your sphere, you provide quality goods and in 18 months I haven’t had a single malfunction. The employees of your company know their products inside and out, I won’t buy anywhere but from you. Two years ago I decided to try working in the arcade machine business, I met some people who were already doing something similar here. It all looked quite attractive, small expenses and good profit. So I decided to invest my hard-earned money, and immediately the question arose where to buy equipment. I was recommended a couple of companies where I could buy quality goods and get a sizable discount. But I decided to look on the Internet anyway, looked through lots of offers, and came across your website – everything is clear, good descriptions, good prices, and also when I ordered several boxing machines they gave a good discount. So I was happy with your work – the order came through quickly, delivery was quick too, and I also got a thorough consultation on the use of the machine. I recommend you as a responsible company that provides quality equipment! I wanted to start making money for myself, and was thinking how to go about it, then quite by accident, I saw your company on the Internet and called you. After a minute’s talk to the manager I had no doubts left. I got an agreement with two places and ordered a boxing machine. Now I have a few of them, and I make a good living, which I could only dream of a year ago. So thank you! I can only say good things about your company, the order was delivered on time, undamaged. After the installment the machine worked for a little while and the display card, but it was our fault, so we couldn’t call upon the warranty. But we were happy to find how easy it was to buy the spare part from your company. We didn’t have to look for it. So at the moment the machine is working just fine and brings a good profit, and we have you to thank for it! A friend bought a boxer and paid twice the price. He tried to convince me it was a good brand and it was going to last forever. I got Rocky. In the end he’s got a lot more problems than I do. And the people in that other company understand nothing about the machines, and you have to pay for spare parts in Euros. But with you it’s so easy and convenient and it’s all direct from the factory. My friend and I ordered two more Rocky boxers together – it’s cheaper that way. The company was recommended by a friend, and you did not disappoint me. You helped me understand everything about this business, it’s all top-class! I recommend your company! It’s a good company, and gives good discounts if you order more than one item. I bought a few boxing machines but I’m going to expand my business, people like to punch them, the main thing is to get people there. It looks like boxers are the best. So I’m going to look for places and and work with them.